Organize your fresh produce and products as soon as it comes in the door! Instead of storing your food products in the boxes they are delivered in, transfer them to the proper designated food storage box, to not only eliminate points of cross contamination, but to make it easier for the future organization of your establishment! Rather than having to open boxes of produce to see what is inside, using a clear food storage box allows you to clearly see the product, and the quantities inside. By enforcing a food transfer system as soon as you receive your deliveries, you can easily do inventory, and ensure the state of your produce on the spot. Use rotation labels to clearly mark down the product, when it arrived, and when to use it by! Square food storage colander’s available to accommodate all types of produce and food products. Not storing produce? By opting to store dry ingredients and products in a food storage box, you can safely stack and store as many boxes as you can, without having to worry about even weight distribution. 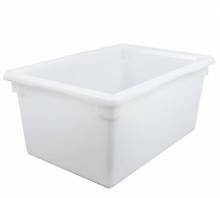 These boxes are ideal for grocery stores, commercial kitchens, food establishments, and more! These can be used for far more than just food storage! Use at home to store seasonal clothes, or in your garage, to efficiently organize sport and house equipment! for product identification. Snap tight Camwear covers sold separately, won’t come off during transportation.